A lovely one-bedroom apartment in a country setting is truly a home away from home, built especially as a bed & breakfast. Just 5 minutes to Knudson Cove Marina and Clover Pass Resort with restaurants, guided fishing or rent your own skiff or boat. See the details below for a description of the B&B and information about breakfast, location, transportation, our pets and smoking policy and a little information about your hosts. Also see what our guests have written in our Guestbook. 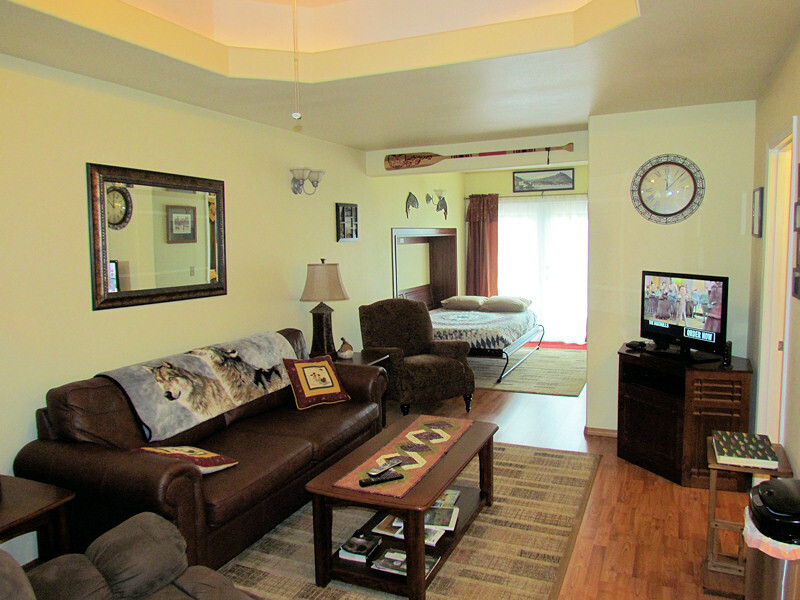 This one-bedroom apartment has an open concept living room, dining area, kitchen and sitting area. 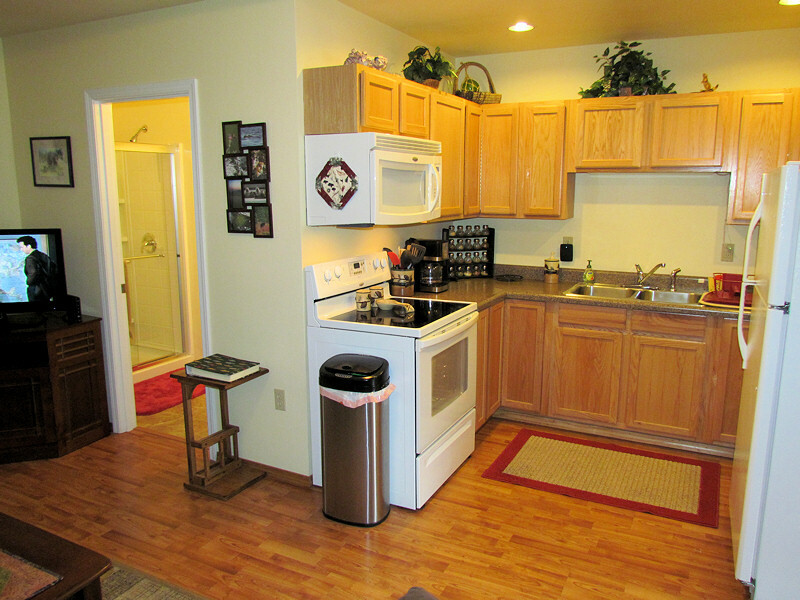 The fully equipped and outfitted kitchen has a glass-top range and overhead microwave. The living room has a leather couch with an extra-long queen sofa sleeper. 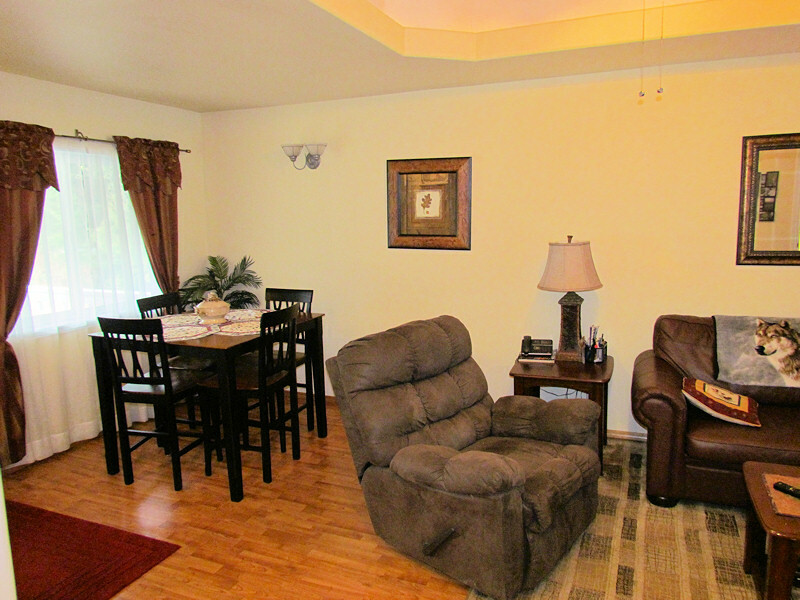 In the sitting area by the French doors there is a new full-size Murphy bed. Both beds have memory foam mattresses. The bedroom has two extra long twin beds that can be converted to a very comfortable King-size bed upon request. 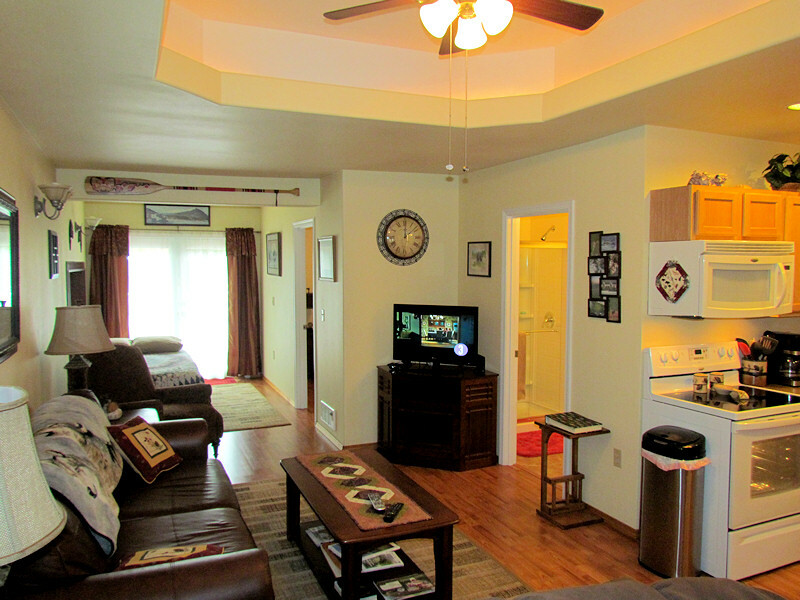 Everything is provided for your comfort: linens, dishes and utensils, private phone, cable television, DVD player, freezer, washer and dryer. Wireless high speed internet access is provided. There is also a BBQ on the private back deck. Breakfast foods are provided for a self-serve breakfast: cereals, milk, juice, muffins, pancake mix, sausage, bacon, eggs, coffee, tea, hot chocolate, and bread. The kitchen is stocked upon arrival with staples and condiments of your choice. 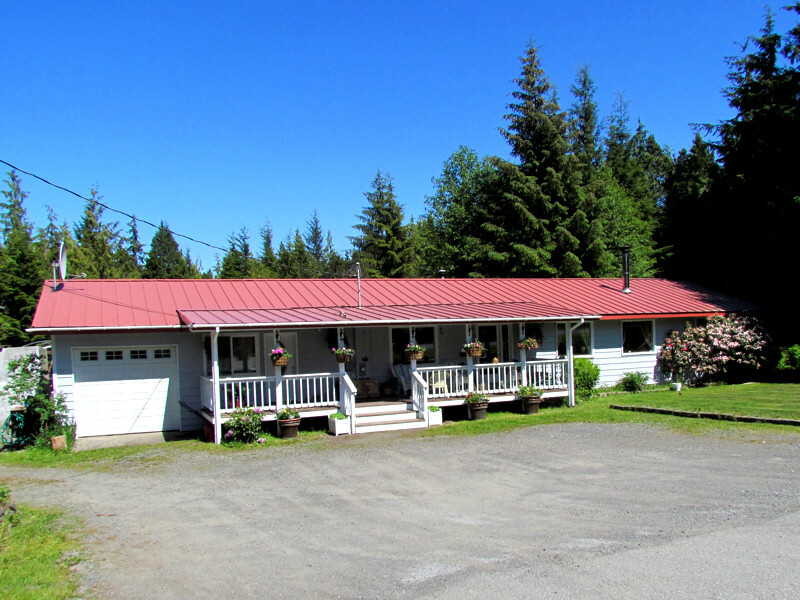 We are located at 310 North Point Higgins Road in Ketchikan, Alaska. It is about 11 miles from the airport parking lot. 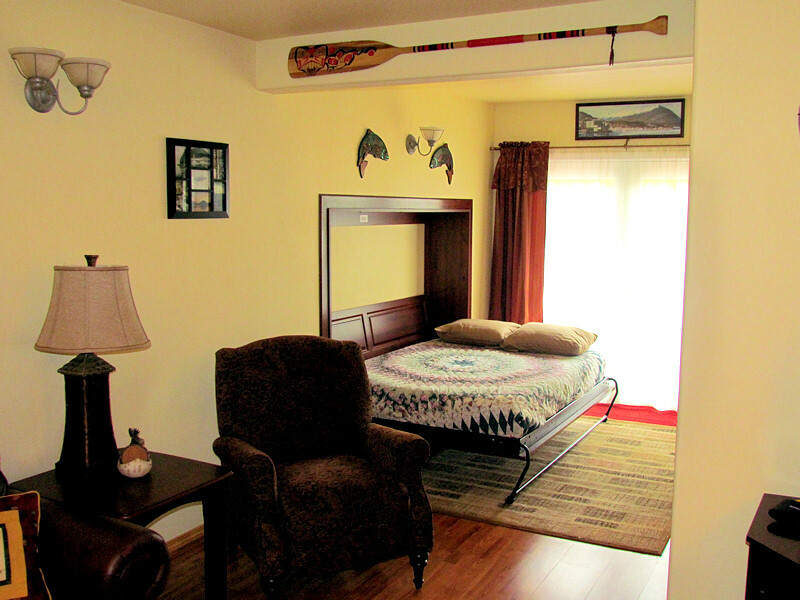 It's about a 20-minute drive from the airport ferry and the Alaska ferry terminal. The house is located on the right side of the street. It is a long light gray house with a red roof. Transportation is not included to this bed & breakfast apartment. If you do not have a car, we have a 7 passenger minivan that we rent to our guests for $50 per day with proof of insurance. 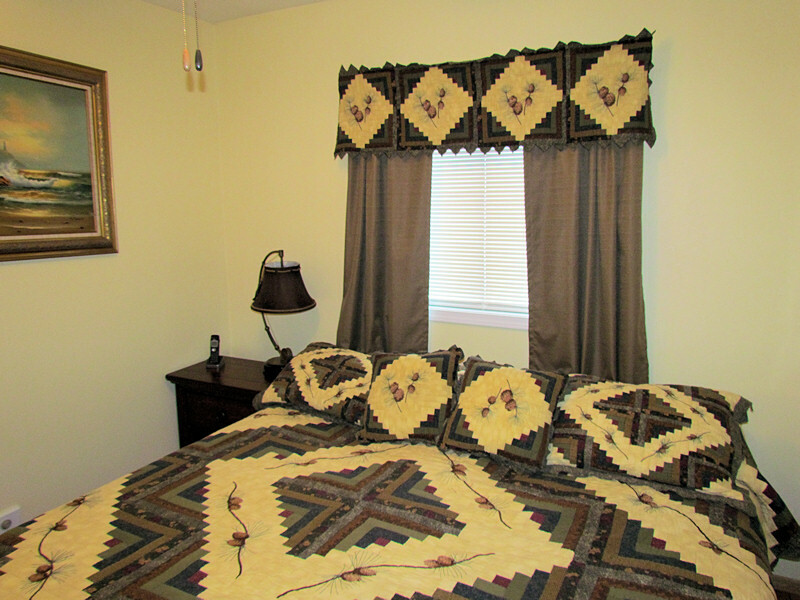 This property has limited Bus service to within 3/10 of a mile of the B&B. Check-in is guaranteed after 4 p.m. and check-out is 12 noon. If you need an earlier check-in or later check out, arrangements will need to be made with the host prior to your arrival. Pets may be allowed with prior approval. Hosts have specific pet rules that will be discussed at time of booking and a pet deposit is required. A charge of $10 per day will be added to the room rate for each pet. Deposit will be refunded if no damage occurs. Your hosts, Lloyd and Lois, live next door. They are looking forward to making your stay with them a memorable experience. Let them know if there is anything they can do for you. Lois works as a hair dresser in a salon in the Plaza Mall. Lloyd is retired and enjoys greeting their B&B guests and fishing. The Bites On! Charters offers an amazing Ketchikan Fishing Trip for anglers that are looking to try their hand at World Class Salmon Fishing and Halibut Fishing. To Book Your Next Ketchikan Fishing Charter, Call The Bites On! Charters At 907-617-4184. Check out their website at http://ketchikanfishingcharter.com. ©2015-2018 The Blind Squirrel Bed & Breakfast - All rights reserved. This site is mobile ready and validates as HTML5 and CSS3.